Click here to hear a MIDI-interpretation of the Remington Steele Opening Theme (only 4 K). For waves go to the Sounds Page. 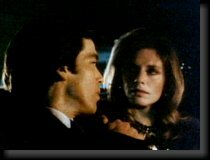 Laura Holt and Remington Steele had come together quite by accident, but they made a great pair of sleuths. She was smart, brassy, and attractive; he was cultured, handsome, and extremely charming. Together they solved complex murder mysteries in high society, while maintaining a relationship that bordered on the romantic. Actually, Remington had begun as a figment of Laura's imagination. Opening her own investigation agency, she found that a woman's name did not bring in assignments, so she invented an imaginary boss - Remington Steele - and business boomed. Trouble was, wealthy clients kept wanting to meet this supersleuth whose name was on the door. Along came an incredibly handsome chap with a suave manner and a mysterious background; just what she needed. Steele (his real name and background remained a mystery) bumbled a lot at first, but learned the private eye's trade quickly and soon was more than a front man for Laura. A fan of old Hollywood movies, he often pursed a case by playing out a scene from a classic film like The Thin Man, Notorious, or Key Largo. With easy banter and close teamwork, and occasional comic interludes, the stylish pair proved that romance and mystery did still mix. There were changes in the supporting cast for the second season, as Bernice the secretary (Janet DeMay) ran off with a saxophone player and was replaced by Mildred (Doris Roberts), an ex-I.R.S. agent who had lost her government job after letting Remington beat a tax-evasion charge; and Murphy, Laura's original partner (James Read), left to form his own agency.